Ha, ha, ha. I could barely type the name of this recipe (or say it for that matter) without cracking up. I'm such a redneck under it all that it just seems way too sophisticated for me. I'm such a fraud. But I have to say that this was a delicious appetizer and I felt like such a grown up serving these (I know I'm 37 but I still feel like I should sit at the kids table). I bought the figs at Costco. And then started experimenting because I have never cooked or baked with a fig in my life. 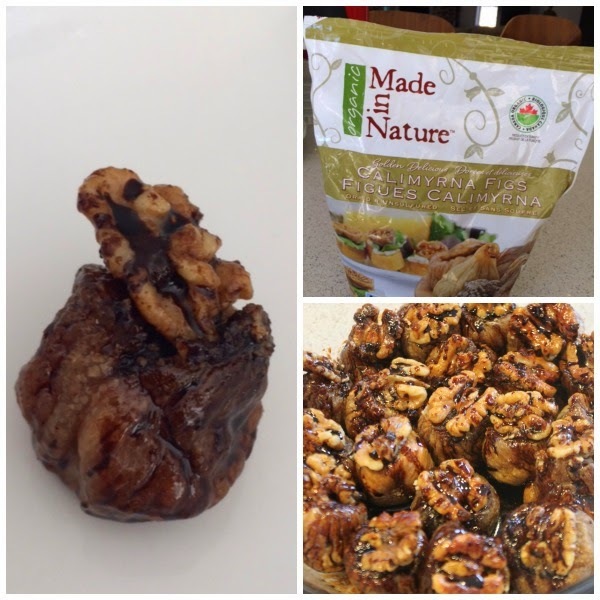 The combination of sweet figs, nutty walnuts, creamy goat cheese and balsamic vinegar is just to die for. And you can prepare it and then refrigerate it so you can relax when guests arrive to play the part of super sophisticated, calm and cool hostess. Or maybe you can - I'm frazzled most of the time no matter how prepared I think I am. If only I still had a shot of home-brew at parties I'd be a bit more zen......until I got crazy. That's why I don't drink anymore. That and it was poisoning me. But I still like a good party. And a good appetizer. So here's a new one for the rotation. Hope you enjoy! Serve it with some red wine if you want to really endear your girlfriends..............or some home brew if you want to impress your redneck friends.............or some rooibos tea if you want to keep it clean like me! The figs may be quite flattened when they come out of the bag. I formed/plumped them up with my fingers so they were full. Then I cut off the top stem and make a small incision (butter knife width) at the top of the fig. I put the top of the knife in the fig and wiggled it around to make a cavity for the goat cheese to go in. I used a knife to stuff the goat cheese into the fig. In a saucepan, melt Earth balance and then add walnuts and sugar. Fry over medium heat for about 3 minutes until the walnuts are cooked through and a bit crunchy. Bring the balsamic vinegar to a low boil over medium high heat and then reduce heat to a low simmer. Using a whisk, stir the vinegar frequently until it starts to thicken (about 3 - 4 minutes). Add EVOO and sugar and continue mixing until sugar is dissolved. Remove from heat. 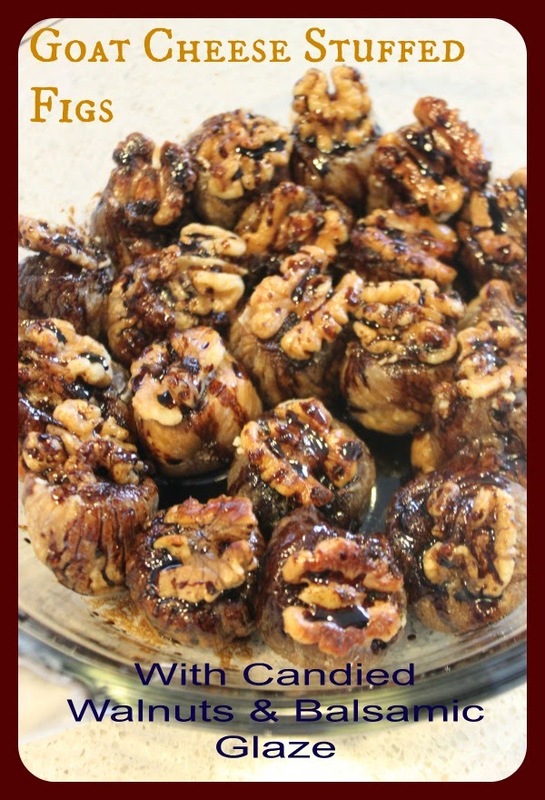 I put the stuffed figs into a small glass casserole dish and topped each one with a candied walnut. I then drizzled with the balsamic glaze. When you are ready to serve, bake the figs at 325 degrees for about 15 to 20 minutes or until warned through. Serve and enjoy!